Got a burning idea that you want to share with Portland? Well, we’d like to help you with that! We’re really excited to announce that you can join us on April 8, 2015, for Ignite Portland 13 held at the historic Hollywood Theater. Ignite Portland is an exciting, fast-paced, night of presentations where people can share their passions and burning ideas. The rules are fairly simple: 20 sides x 15 seconds per slide (auto-advancing) = 5 minutes of awesome. Presentations can be on nearly any topic, so long as they can teach, enlighten, or inspire us. Some examples from past Ignite Portland talks can be found in our video archive! Talk proposals for Ignite Portland 13 are already open! We’re looking for speakers and we’d love to hear from you. The submission deadline is 11:59PM on February 22, 2015, so submit your idea today! Need some inspiration for you IP13 talk? Check out the video from Ignite Portland 12 on the Stumptown Syndicate channel. We’re really grateful to brytCAST for their sponsorship and support of Ignite Portland! We’re on the look out for sponsors to help us make Ignite Portland great. Interesting in helping us out, check out our sponsorship details! 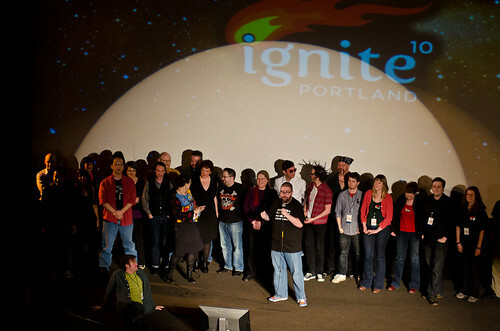 Volunteers are what make Ignite Portland possible and awesome. Check out the kind of help we need and get involved today!